Cooking without a Net: Holy Guacamole! Avocados were on sale at the grocery store this week so I bought a couple. And Frontera chips were two for one so it just seemed like it was meant to be. The avocados were perfectly ripe today so I decided it was time to make me some guacamole. I like to keep my guacamole simple, so the flavor of the avocado is the main thing you taste. A little lemon or lime juice, half a tomato, a little salt, garlic powder and pepper and you've got yourself a tasty treat. Doesn't it look good? And how do you like the bowl? I made it myself back when I was taking pottery classes. 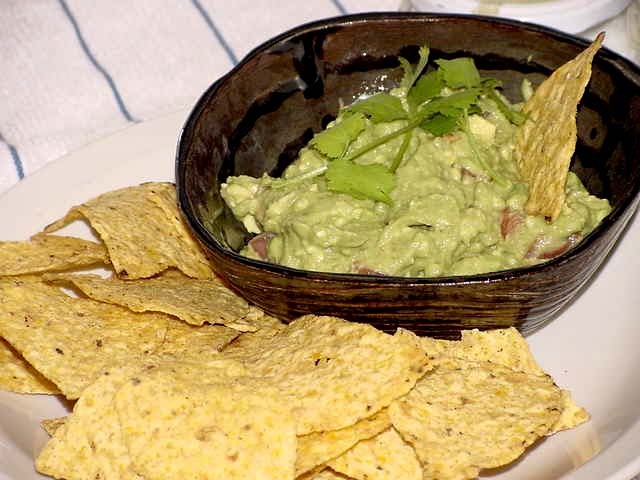 There are two kinds of guacamole people--those who spice and those who don't. Personally, I don't like salsa or peppers in my guacamole. I like my salsa on the side, so sometimes I get the heat and sometimes I get the pure creamy avocado goodness. And I like my salsa fresh. Now that summer's in the air I'll have to make some. It would have been great tonight. Many people stay away from avocados because they're high in fat. While that is true, there are far more reasons to eat avocados for your health than to stay away from them. They help lower LDL cholesterol, have tons of potassium, and help your body absorb carotenoids from vegetables. So eat away, I say! My savory dish for Barbara's spice challenge is simmering on the stove. It sure smells good. It's the only thing that kept me from eating up all the guacamole and chips in one sitting. I'm going to make the sweet part on Tuesday, and then I'll write it up at the end of the week. The fifteenth seemed so far away and now it's almost here. Time flies when you have deadlines.